I'm a big time horror movie fan. 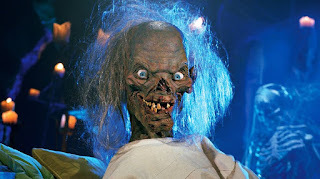 Not so much of the movies that are coming out now, but more of the slasher horror movies of the 80's. Besides being traumatized by the original Nightmare on Elm Street when I was a little kid, there are two main reasons that I love horror. 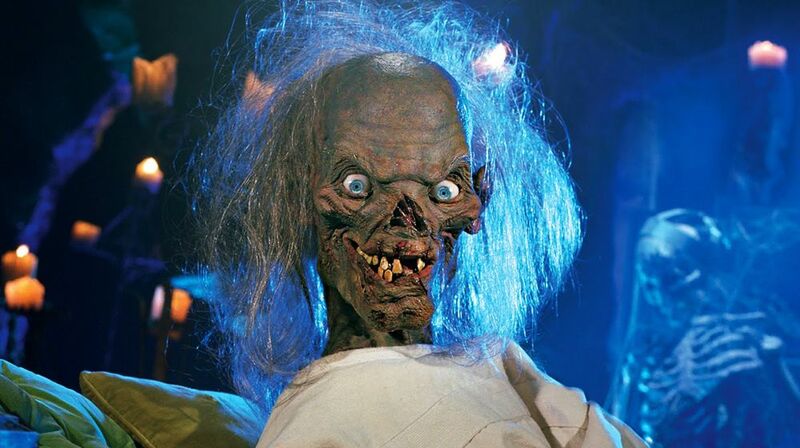 One is seeing Evil Dead 2 for the first time, and the second is the HBO show Tales from the Crypt that was based off the comics of the same name. But anyway, I keep repeating myself here. I'm sure by know you probably all know that I like these kinds of movies and T.V. shows, so I'll move on. 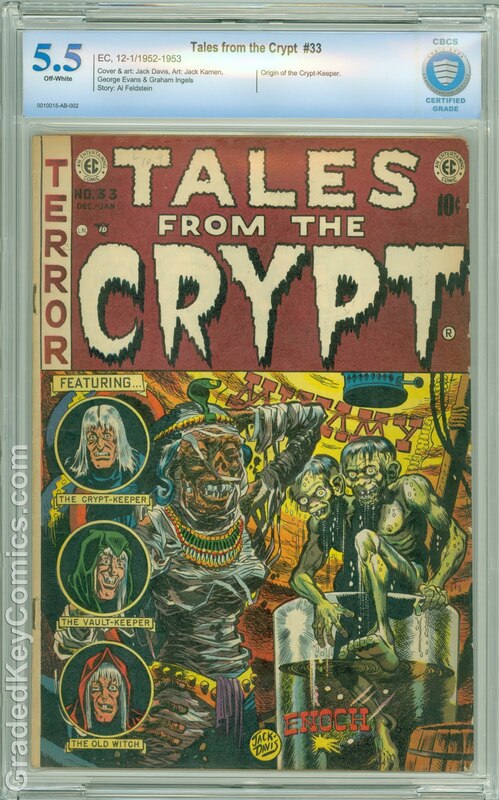 Ok, since I've already talked about the first appearance of the Crypt Keeper, I decided it would be the perfect time for me to dig into my box of goodies and share one of my comics with you, and it's also keeping with my October horror theme as well. 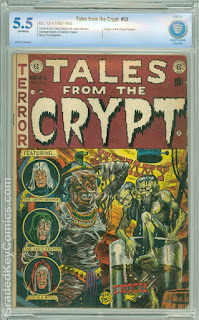 This is my copy of Tales from the Crypt #33, and this comic holds the origin of the Crypt Keeper. See, everyone gets an origin story, even creepy undead storytellers that live in dark, eerie basements. I'm not going to go into the specifics of this comic, or talk about the origin of this character, but rather tell you the story of how and why I decided to buy it instead. As I stated in the beginning, I liked the HBO show, and when I learned of this comic and it's key issue goodness, I immediately started hunting for a copy. Now, copies of this comic don't come up too often. They are more plentiful than the first appearance of good ol CK, but not by much. Usually the copies that I found were either too expensive, or in dirt condition that I didn't want it. It had to be a decent looking copy that wasn't way overpriced. So, as I was cruising through eBay one day, I found a raw copy that I thought looked pretty nice from the pictures that were available. I don't exactly remember what the seller was asking for it. I want to say it was $250, but that could be wrong. I did my normal research, i.e. checking the price guide and GoCollect, and decided that $175 was the highest I was willing to go and made an offer. Buying raw copies online is always a gamble and I didn't want to overpay if the grade was lower than I thought I might have been. So, with no counteroffers from the seller, I ended up snagging this comic for $175. I felt like I got a pretty good deal, and I'm assuming the seller got what he wanted from the sale, so all parties left happy. Now, CBCS had recently opened their doors for business, and I'd already sent in my sample book to try them out. You can read about that comic here. So, I sent this in with my next batch of books to be graded. I try to send in more than one book for grading because it helps to save money on shipping charges. It does take a while for me to get enough books to send in, so I usually only have one or two shipments for grading each year. It took a while, like it usually does with grading companies, but I finally got it back. Overall, I'm happy with the 5.5 F- that this book got, and it was a little higher of a grade than I was expecting it to be, but only by a half grade or so. I think I made a good investment decision by buying this book at the price I did. There is no sales information that I could find for this grade, but recently a 5.0 VF/F copy sold on eBay for $370. Since I like these old horror comics, especially the old EC Comics, this is one of those books that's a part of history and I'm very proud to own a copy. Needless to say, this will be staying in my collection for quite a while. You finally got this one! Congrats, bro! Nice snag! Thanks. I might have to pick me up some more of these early EC horror comics in the future. But for now, I'm concentrating on my ASM collection. ©2016 Graded Key Comics. Awesome Inc. theme. Powered by Blogger.